For other uses, see Kellogg (disambiguation). The Kellogg Company, doing business as Kellogg's, is an American multinational food-manufacturing company headquartered in Battle Creek, Michigan, United States. Kellogg's produces cereal and convenience foods, including cookies, crackers, and toaster pastries and markets their products by several well known brands including Corn Flakes, Keebler, Pringles, Eggo, and Cheez-It. Kellogg's mission statement is "Nourishing families so they can flourish and thrive." Kellogg's products are manufactured and marketed in over 180 countries. Kellogg's largest factory is at Trafford Park in Trafford, Greater Manchester, United Kingdom, which is also the location of its European headquarters. Other corporate office locations outside of Battle Creek include Chicago, Dublin, Shanghai, and Querétaro City. Kellogg's holds a Royal Warrant from Queen Elizabeth II and the Prince of Wales. Brothers Dr. John Harvey and Will Keith Kellogg founded a health food company, the Battle Creek Sanitarium Health Food Company in 1898. This company produced foodstuffs for current and former patients at Dr. J. H. Kellogg's Battle Creek Sanitarium. The company later became known as the Battle Creek Sanitarium Food Company in 1901. During this time, the company produced and marketed health foods such as corn flakes, Granola and Caramel Cereal Coffee. The company merged with the Sanitas Nut Food Company (founded in 1899 by Dr. J. H. Kellogg) to become the Kellogg Food Company in July 1908, and sold nut butters and meat substitutes, and it was then that the company's products all began to be sold under the trade name, "Kellogg's". At this time, Dr. J. H. Kellogg owned all but 2 of its 15,000 shares of stock. In 1921, it changed its name back to Battle Creek Food Company. However, Dr. John Harvey forbade his brother Will from distributing cereal beyond his patients. 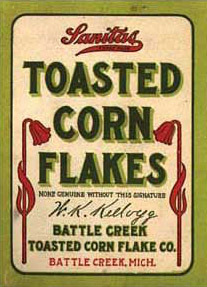 As a result, the brothers fell out, and W. K. launched the Battle Creek Toasted Corn Flake Company on February 19, 1906. Convincing his brother to relinquish Sanitas's rights to the product, Will's company produced and marketed the hugely successful Kellogg's Toasted Corn Flakes and was renamed the Kellogg Toasted Corn Flake Company in 1909, taking on the current name of the Kellogg Company in 1922. In 1930, the Kellogg Company announced that most of its factories would shift towards 30-hour work weeks, from the usual 40. W.K. Kellogg stated that he did this so that an additional shift of workers would be employed in an effort to support people through the depression era. This practice remained until World War II, and continued briefly after the war, although some departments and factories remained locked into 30-hour work weeks until 1980. From 1968 to 1970, the slogan “Kellogg’s puts more into your morning” was used on Saturday morning tv shows. From 1969 to 1977, Kellogg's acquired various small businesses including Salada Foods, Fearn International, Mrs. Smith's Pies, Eggo, and Pure Packed Foods; however, it was later criticized for not diversifying further like General Mills and Quaker Oats were. After underspending its competition in marketing and product development, Kellogg's U.S. market share hit a low 36.7% in 1983. A prominent Wall Street analyst called it "a fine company that's past its prime" and the cereal market was being regarded as "mature". Such comments stimulated Kellogg chairman William E. LaMothe to improve, which primarily involved approaching the demographic of 80 million baby boomers rather than marketing children-oriented cereals. In emphasizing cereal's convenience and nutritional value, Kellogg's helped persuade U.S. consumers age 25 to 49 to eat 26% more cereal than people of that age ate five years prior. The U.S. ready-to-eat cereal market, worth $3.7 billion at retail in 1983, totaled $5.4 billion by 1988 and had expanded three times as fast as the average grocery category. Kellogg's also introduced new products including Crispix, Raisin Squares, and Nutri-Grain Biscuits and reached out internationally with Just Right aimed at Australians and Genmai Flakes for Japan. During this time, the company maintained success over its top competitors: General Mills, which largely marketed children's cereals, and Post, which had difficulty in the adult cereal market. In March 2001, Kellogg's made its largest acquisition, the Keebler Company. Over the years, it has also gone on to acquire Morningstar Farms and Kashi divisions or subsidiaries. Kellogg's also owns the Bear Naked, Natural Touch, Cheez-It, Murray, Austin cookies and crackers, Famous Amos, Gardenburger (acquired 2007), and Plantation brands. Presently, Kellogg's is a member of the World Cocoa Foundation. In 2012, Kellogg's became the world's second-largest snack food company (after PepsiCo) by acquiring the potato crisps brand Pringles from Procter & Gamble for $2.7 billion in a cash deal. In 2017, Kellogg's acquired Chicago-based food company Rxbar for $600 million. Earlier that year, Kellogg's also opened new corporate office space in Chicago's Merchandise Mart for its global growth and IT departments. In the UK, Kellogg's also released the W. K. Kellogg brand of organic, vegan and plant-based cereals (such as granolas, organic wholegrain wheat, and "super grains") with no added sugars. In 2018, Kellogg decided to cease their operations in Venezuela due to the economic crisis the country is facing. On April 1, 2019, Kellogg announced that it was selling the Keebler and Famous Amos brands to Ferrero SpA for $1.3 billion. The acquisition is expected to close in July of that year. For the fiscal year 2017, Kellogg's reported earnings of US$1.269 billion, with an annual revenue of US$12.932 billion, a decline of 0.7% over the previous fiscal cycle. Kellogg's market capitalization was valued at over US$22.1 billion in November 2018. Chocolate Corn Flakes: a chocolate version of Corn Flakes. First sold in the UK in 1998 (as Choco Corn Flakes or Choco Flakes), but discontinued a few years later. Re-released in 2011. Banana-flavoured variation of Rice Krispies. First appeared in the UK in 1995, but discontinued shortly thereafter. C-3PO's cereal: Introduced in 1984 and inspired by the multi-lingual droid from Star Wars, the cereal called itself "a New (crunchy) Force at Breakfast" and was composed of "twin rings phased together for two crunches in every double-O". In other words, they were shaped like the digit 8. After severing the cereal's ties to Star Wars, the company renamed it Pro-Grain and promoted it with sports-oriented commercials. Cocoa Hoots: Manufactured briefly in the early 1970s, this cereal resembled Cheerios but was chocolate-flavored. The mascot was a cartoon character named Newton the Owl, and one of its commercials featured a young Jodie Foster. Frosted Rice: This was a combination of Frosted Flakes and Rice Krispies, using Rice Krispies with frosting on them. Tony Jr. was the brand's mascot. 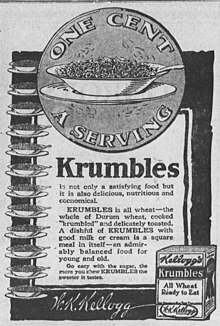 Krumbles cereal: Manufactured approximately from the 1920s to the mid 1960s; based on shreds of wheat but different from shredded wheat in texture. Unlike the latter, it tended to remain crisp in milk. In the Chicago area, Krumbles was available into the late 1960s. It was also high in fiber, although that attribute was not in vogue at the time. OKs cereal (early 1960s): Oat-based cereal physically resembling the competing brand Cheerios, with half the OKs shaped like letter O's and the other half shaped like K's, but did not taste like Cheerios. OKs originally featured Big Otis, a giant, burly Scotsman, on the box; this was replaced by the more familiar Yogi Bear. Pep: Best remembered as the sponsor of the Superman radio serial. Pokémon Cereal: A limited edition cereal that contained marshmallow shapes in the forms of Gen I Pokémon Pikachu, Oddish, Poliwhirl and Ditto. They later returned with marshmallows formed like Cleffa, Wobbuffet and Pichu for a short time. Various methods have been used in the company's history to promote the company and its brands. Foremost among these is the design of the Kellogg's logo by Ferris Crane under the art direction of famed type guru Y. Ames. Another was the well-remembered jingle "K E double-L, O double-good, Kellogg's best to you!" With the rising popularity of patent medicine in early 20th century advertising, The Kellogg Company of Canada published a book named A New Way of Living that showed readers "how to achieve a new way of living; how to preserve vitality; how to maintain enthusiasm and energy; how to get the most out of life because of a physical ability to enjoy it." It touted the All-Bran cereal as the secret to leading "normal" lives free of constipation. Kellogg's was a major sponsor throughout the run of the hit CBS panel show What's My Line? It and its associated products Frosted Flakes and Rice Krispies were also major sponsors for the PBS Kids children's animated series Dragon Tales. Kellogg's is a sponsor of USA Gymnastics and produces the Kellogg's Tour of Gymnastics, a 36-city tour held after the Olympic games and featuring performances by recent medal-winning gymnasts from the United States. W.K. Kellogg was the first to introduce prizes in boxes of cereal. The marketing strategy that he established has produced thousands of different cereal box prizes that have been distributed by the tens of billions. Kellogg's Corn Flakes had the first cereal premium with The Funny Jungleland Moving Pictures Book. The book was originally available as a prize that was given to the customer in the store with the purchase of two packages of the cereal. But in 1909, Kellogg's changed the book giveaway to a premium mail-in offer for the cost of a dime. Over 2.5 million copies of the book were distributed in different editions over a period of 23 years. In 1945, Kellogg's inserted a prize in the form of pin-back buttons into each box of Pep cereal. Pep pins have included U.S. Army squadrons as well as characters from newspaper comics and were available through 1947. There were five series of comic characters and 18 different buttons in each set, with a total of 90 in the collection. Other manufacturers of major brands of cereal, including General Mills, Malt-O-Meal, Nestlé, Post Foods, and Quaker Oats, followed suit and inserted prizes into boxes of cereal to promote sales and brand loyalty. Licensed brands have been omitted since the corresponding mascots would be obvious (e.g. Spider-Man is the mascot for Spider-Man Spidey-Berry). Kellogg's made its first foray into auto racing between 1991 and 1992 when the company sponsored the #41 Chevrolets fielded by Larry Hedrick Motorsports in the NASCAR Winston Cup Series and driven by Phil Parsons, Dave Marcis, Greg Sacks, Hut Stricklin, and Richard Petty, but they gained greater prominence for their sponsorship of two-time Winston Cup Champion Terry Labonte from 1993 to 2006, the last 12 years of that as the sponsor for Hendrick Motorsports' #5 car. Kellogg's sponsored the #5 for Labonte, Kyle Busch, Casey Mears, and Mark Martin until 2010, and it then served as an associate sponsor for Carl Edwards' #99 car for Roush Fenway Racing. Kellogg's placed Dale Earnhardt on Kellogg's Corn Flakes boxes for 1993 six-time Winston Cup champ and 1994 seven-time Winston Cup champ, as well as Jeff Gordon on the Mini Wheats box for the 1993 rookie of the year, 1995 Brickyard 400 inaugural race, 1997 Champion, and 1998 three-time champ, and a special three-pack racing box set with Dale Earnhardt, Jeff Gordon, Terry Labonte, and Dale Jarrett in 1996. Kellogg's has used some merchandising for their products. Kellogg's once released Mission Nutrition, a PC game that came free with special packs of cereal. It played in a similar fashion as Donkey Kong Country; users could play as Tony the Tiger, Coco the Monkey, or Snap, Crackle, and Pop. Kellogg's has also released "Talking" games. The two current versions are Talking Tony and Talking Sam. In these games, a microphone is used to play games and create voice commands for their computers. In Talking Tony, Tony the Tiger, one of Kellogg's most famous mascots, would be the main and only character in the game. In Talking Sam, Toucan Sam, another famous mascot, would be in the game, instead. Some [toy cars] have the Kellogg's logo on them, and occasionally their mascots. There was also a Talking Snap Crackle and Pop software. Kellogg's frequently partners with the Olympic Games to feature American athletes from the Olympic Games on the packages of their cereal brands. In 2017, the company announced its marketing campaign for the 2018 Winter Olympic Games featuring American athletes Nathan Chen, Kelly Clark, Meghan Duggan and Mike Schultz. Some of Kellogg's marketing has been questioned in the press, prompted by an increase in consumer awareness of the mismatch between the marketing messages and the products themselves. Food bloggers are also questioning the marketing methods used by cereal manufacturing companies such as Kellogg's, due to their high sugar content and use of ingredients such as high-fructose corn syrup. On June 25, the company voluntarily began to recall about 28 million boxes of Apple Jacks, Corn Pops, Froot Loops and Honey Smacks because of an unusual smell and flavor from the packages' liners that could make people ill. Kellogg's said about 20 people complained about the cereals, including five who reported nausea and vomiting. Consumers reported the cereal smelled or tasted waxy or like metal or soap. Company spokeswoman J. Adaire Putnam said some described it as tasting stale. However, no serious health problems had been reported. The suspected chemical that caused the illnesses was 2-methylnaphthalene, used in the cereal packaging process. Little is known about 2-methylnaphthalene's impact on human health as the Food and Drug Administration has no scientific data on its impact on humans, and the United States Environmental Protection Agency (EPA) also does not have health and safety data. This is despite the EPA having sought information on it from the chemical industry for 16 years. 2-Methylnaphthalene is a component of crude oil and is "structurally related to naphthalene, an ingredient in mothballs and toilet-deodorant blocks" that the EPA considers a possible human carcinogen. Kellogg's offered consumers refunds in the meantime. Only products with the letters "KN" following the use-by date were included in the recall. The products were distributed throughout the U.S. and began arriving in stores in late March 2010. Products in Canada were not affected. Kellogg's issued a voluntary recall of some of its "Frosted Mini-Wheats Bite Size Original" and "Mini-Wheats Unfrosted Bite Size" products due to the possibility of flexible metal mesh fragments in the food. The affected products varied in size from single-serving bowls to large 70-ounce cartons. Use-by dates printed on the recalled packages ranged from April 1, 2013, to September 21, 2013, and were accompanied by the letters KB, AP or FK. —Jon Leibowitz, Chairman of the F.T.C. On June 3, 2010, Kellogg's was found to be making unsubstantiated and misleading claims in advertising their cereal products by the Federal Trade Commission (FTC). Kellogg's responded by stating "We stand behind the validity of our product claims and research, so we agreed to an order that covers those claims. We believe that the revisions to the existing consent agreement satisfied any remaining concerns." The FTC had previously found fault with Kellogg's claims that Frosted Mini-Wheats cereal improved kids' attentiveness by nearly 20%. The Children's Advertising Review Unit of the Council of Better Business Bureaus has also suggested that the language on Kellogg Pop-Tarts packages saying the pastries are "Made with Real Fruit" should be taken off the products. In July 2012, the UK banned a "Special K" advertisement due to its citing caloric values that did not take into account the caloric value of milk consumed with the cereal. In 2016 an ad telling UK consumers that Special K is “full of goodness” and “nutritious” was banned. According to Amnesty International in 2016, Kellogg's palm oil provider Wilmar International profited from 8 to 14-year-old child labor and forced labor. Some workers were extorted, threatened or not paid for work. Some workers suffered severe injuries from chemicals such as Paraquat. Kellogg's alleged not being aware of the child abuses due to traceability; Amnesty's human rights director replied that "Using mealy-mouthed excuses about 'traceability' is a total cop-out." Kellogg's donated around US$2 million opposing California Proposition 37, a 2012 ballot initiative that, if enacted, would have required compulsory labeling of genetically engineered food products. In March 2016, though, they vowed to label all of their products with genetically modified organisms as such by 2020. In January 2012, Kellogg's gave the Calhoun School a $250,000 grant for a "three-part youth-based project on issues of white privilege and institutionalized racism". In August 2014, Kellogg's called on the President to support the Paris Agreement on climate change. In 2016, Kellogg Company urged President-elect Donald Trump to "continue the Paris Climate Agreement". 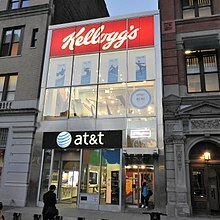 Kellogg's has donated to notable groups opposing voter-ID laws, such as the Applied Research Center (now RaceForward). The company also decided to remove their advertisements from the Breitbart News website. Breitbart News in turn called for a boycott of Kellogg's products. The Trafford Park factory in Greater Manchester, England—Kellogg's European base since 1938. The factory produces more cornflakes than any other Kellogg's factory in the world. ^ a b c "K Company Financials/Income Statement". ^ a b "K Company Financials/Balance Sheet". ^ "Fortune 500/Kellogs". Retrieved March 17, 2019. ^ "Our Vision & Purpose". Kelloggcompany.com. Retrieved December 3, 2016. ^ "Kellogg Company Fact Sheet (PDF)" (PDF). kelloggcompany.com. Retrieved April 24, 2014. ^ a b "Global brand, local values". Manchester Evening News. May 27, 2008. ^ "Our Locations". www.kelloggcareers.com. Retrieved May 27, 2018. ^ "Kellogg Marketing & Sales Co (UK) Ltd | Royal Warrant Holders Association". www.royalwarrant.org. Retrieved January 28, 2018. ^ a b c d William Shurtleff; Akiko Aoyagi (6 January 2014). History of Seventh-day Adventist Work with Soyfoods, Vegetarianism, Meat Alternatives, Wheat Gluten, Dietary Fiber and Peanut Butter (1863-2013): Extensively Annotated Bibliography and Sourcebook. Soyinfo Center. pp. 994–5. ISBN 978-1-928914-64-8. ^ André Benjamin (30 June 2013). Conquer The Recession. Andre J Benjamin. p. 27. GGKEY:6SA764GJCF1. ^ Jeffrey Kaplan (May–June 2008). "The Gospel of Consumption". Retrieved June 25, 2010. ^ Kellogg Company FundingUniverse.com. Retrieved on 7-18-09. ^ Sellers, Patricia (August 29, 1988). "HOW KING KELLOGG BEAT THE BLAHS". Fortune. Retrieved June 10, 2015. ^ "Kellogg to buy Pringles for $2.7 billion". Reuters. February 15, 2012. ^ Wilkins, Peter. "What $600M RXBar Acquisition By Kellogg's Says About Chicago's Simple Food And Beverage Industry". Forbes. Retrieved January 28, 2018. ^ Trotter, Ryan Ori, Greg. "Kellogg opens 50-employee Merchandise Mart office". chicagotribune.com. ^ "Kellogg targets health-conscious consumers with W.K.Kellogg line - FoodBev Media". Foodbev Media. 14 November 2017. Retrieved 23 August 2018. ^ "Kellogg Says It's Discontinuing Venezuela Operations". Bloomberg. Retrieved May 17, 2018. ^ Hirsch, Lauren (1 April 2019). "Kellogg to sell Keebler, Famous Amos to Nutella-owner Ferrero". www.cnbc.com. Retrieved 6 April 2019. ^ "Kellogg Company - AnnualReports.com". www.annualreports.com. Retrieved 2018-12-03. ^ "Murray Sugar Free : About Us". Murraysugarfree.com. Retrieved December 3, 2016. ^ "Murray : The Cookie and Cracker People : Homepage". Murraysugarfree.com. Retrieved December 3, 2016. ^ a b c d "Comedy News, Viral Videos, Late Night TV, Political Humor, Funny Slideshows – HuffPost Comedy". The Huffington Post. Archived from the original on March 2, 2012. ^ "Kringelz - Produkte - Kellogg's". archive.org. July 6, 2011. ^ "Kringelz - Produkte - Kellogg's". archive.org. July 19, 2011. ^ a b c d e f g h i "A Tribute to Discontinued Cereals". Gunaxin Grub. ^ "Concentrate Cereal – MrBreakfast.com". mrbreakfast.com. ^ "Heartwise (Kellogg's): Heartwise Cereal Box". mrbreakfast.com. ^ a b "Breakfast cereal mascots: Beloved and bizarre". cbsnews.com. ^ "Krumbles Cereal – MrBreakfast.com". mrbreakfast.com. ^ "Chiller – Scary Good". fearnet.com. ^ "Raisin Squares Cereal – MrBreakfast.com". mrbreakfast.com. ^ "Raisins Rice & Rye Cereal – MrBreakfast.com". mrbreakfast.com. ^ "3 Point Pops Cereal – MrBreakfast.com". mrbreakfast.com. ^ Robbins, David (April 29, 2014). "What's My Line? : A Treasure Trove". Retrieved December 25, 2014. ^ "CTW – Dragon Tales – Fun & Games! (see bottom-of-page information)". Archived from the original on June 20, 2000. Retrieved December 5, 2014. ^ "Kellogg's Tour of Gymnastics Champions". Kelloggstour.com. Retrieved December 3, 2016. ^ a b Rod Taylor (September 1, 2003). "Kelloggs history, William Keith (W. K.) Kellogg legacy | Promotional Marketing content from Chief Marketer". Promomagazine.com. Archived from the original on February 8, 2012. Retrieved November 18, 2012. ^ Phil Ament. 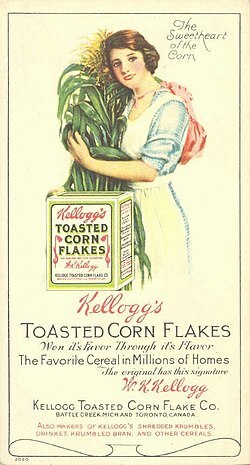 "Corn Flakes History – Invention of Kellogg's Corn Flakes". Ideafinder.com. Retrieved December 27, 2010. ^ "Kellogg's Offers First Cereal Premium Prize". Timelines.com. Retrieved December 27, 2010. ^ "Simone Biles and the Final Five Land a Cereal Box—And It's Not Wheaties". Time. Retrieved January 28, 2018. ^ "Kellogg's Olympic Push Begins Well Before the Winter Games". Retrieved January 28, 2018. ^ The Age. "Parents fed up with junk food ads". The Age. November 9, 2011. ^ Richard Enion. "Do Kellogg's Really Care About You?". Richeats.tv, November 16, 2011. ^ "Kellogg's recalls 28 million boxes of cereal". Allvoices.com. Archived from the original on October 10, 2012. Retrieved November 18, 2012. ^ Layton, Lyndsey (August 2, 2010). "US regulators lack data on health risks of most chemicals". Washington Post. ^ "2-Methylnaphthalene (CASRN 91-57-6)". United States Environmental Protection Agency. May 3, 2007. Retrieved October 27, 2010. ^ TOMSON and ZIOBRO, BILL and PAUL. "Kellogg Recalls Mini-Wheats". The Wall Street Journal. Retrieved October 11, 2012. ^ a b "FTC Investigation of Ad Claims that Rice Krispies Benefits Children's Immunity Leads to Stronger Order Against Kellogg". FTC. June 3, 2010. Retrieved June 4, 2010. ^ "In the Matter of Kellogg Company, FTC Docket No. C-4262" (PDF). Concurring Statement of Commissioner Julie Brill and Chairman Jon Leibowitz. Federal Trade Commission. June 3, 2010. Retrieved June 4, 2010. ^ a b Chan, Sewell (June 4, 2010). "Kellogg to Restrict Ads to Settle U.S. Inquiry Into Health Claims for Cereal". The New York Times. Retrieved June 4, 2010. ^ Carey, Susan. "Snap, Crackle, Slap: FTC Objects to Kellogg's Rice Krispies Health Claim". The Wall Street Journal. June 4, 2010. ^ InvestorPlace (June 4, 2010). "Feds say Kellogg ads mislead parents". Top Stocks. MSN Money. Retrieved June 4, 2010. ^ "Britain bans Kellogg's for 'misleading' advertisement". The Times Of India. July 5, 2012. ^ Sweney, Mark (July 20, 2016). "Kellogg's Special K ads banned over 'full of goodness' and 'nutritious' claims". The Guardian. Retrieved May 30, 2017. ^ Kishore, Divya (November 30, 2016). "Amnesty report slams popular brands for profiting from labour abuses at Wilmar". Retrieved December 3, 2016. ^ Davies, Rob (November 30, 2016). "Firms such as Kellogg's, Unilever and Nestlé 'use child-labour palm oil'". The Guardian. Retrieved December 2, 2016. ^ "Prop. 37: Requires labeling of food products made from genetically modified organisms. | Voter's Edge". Votersedge.org. November 6, 2012. Retrieved August 25, 2013. ^ "Kellogg to Label All GMOs Nationwide". The Daily Meal. Retrieved 2018-06-14. ^ CRC Staff (May 1, 2013). "The W.K. Kellogg Foundation: Subverting democracy and balkanizing America". 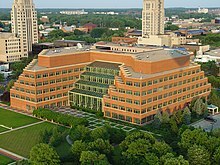 Capital Research Center. ^ Oxfam (August 13, 2014). "Kellogg Steps Up to Tackle Climate Change". Retrieved December 3, 2016. ^ Davis, Dillion (November 17, 2016). "Kellogg Co. urges Trump to uphold Paris Agreement". The Detroit Free Press. Retrieved December 2, 2016. ^ "Race Forward WK Kellogg Foundation Grant Page". November 30, 2016. Retrieved December 3, 2016. ^ O'Connor, Lydia (November 29, 2016). "Kellogg Is Latest Company To Pull Advertising From Breitbart". The Huffington Post. Retrieved December 3, 2016. ^ "Kellogg's dumps Breitbart ads, citing 'values'; Breitbart encourages boycott". Columbus Dispatch. AP. December 1, 2016. Retrieved December 1, 2016. ^ "Factory". Kellogg's. Archived from the original on August 31, 2011. Retrieved August 3, 2011. ^ "Welcome to Careers at Kellogg Australia". Kellogg (Aust.) Pty. Ltd. Retrieved August 25, 2011. ^ "Kellogg to close London cereal factory next year". CBC News. ^ "Kellogg's to close London plant by the end of 2014". London. ^ a b c d e f g "Kellogg Europe Trading Ltd (KETL)". Kellogg Company. Archived from the original on August 31, 2011. Retrieved August 25, 2011. ^ "いい朝食がいい日をつくる - 日本ケロッグ". kellogg.co.jp. ^ "Kellogg to invest $130M in Malaysia plant, eyes Asia-Pacific expansion". Venture Capital Post. January 10, 2014. Retrieved January 20, 2014. ^ "Kellogg Company to invest US$130m in Malaysia". The Malay Mail Online. January 10, 2014. Retrieved January 20, 2014. ^ "Home :: Kellogg's". Kelloggsalarabi.com. Retrieved November 18, 2012. ^ "Kellogg Annual Report 2007 – Kellogg North America Brands". archive.org. August 26, 2008. Archived from the original on 2008-08-26. Retrieved June 14, 2018. ^ "SEC Info – Kellogg Co – '10-K' for 1/1/05 – EX-21.01". Secinfo.com. ^ "Alaska Milk Corporation". Alaskamilk.com.ph. ^ "Kellogg's to build a new factory in Poland". Gosiahill.com. ^ "Kellogg in South Africa". archive.org. December 13, 2009. Wikimedia Commons has media related to Kellogg Company. Collection of mid-twentieth century advertising featuring Kellogg products from The TJS Labs Gallery of Graphic Design.